Besides my Marshmallow Turkey Pops these might just be my favorite Thanksgiving themed pops this year, so I am really excited to share this tutorial with you! An adorable Pilgrim couple, made out of vanilla wafers, marshmallow, and chocolate, how can you not smile when you look at these?! They are reeeeeally cute, and once you have them smiling in your face, it is almost too hard to chomp into them. I was inspired to make these after all the rave reviews I got from my Girl Scout Cookie Pops. 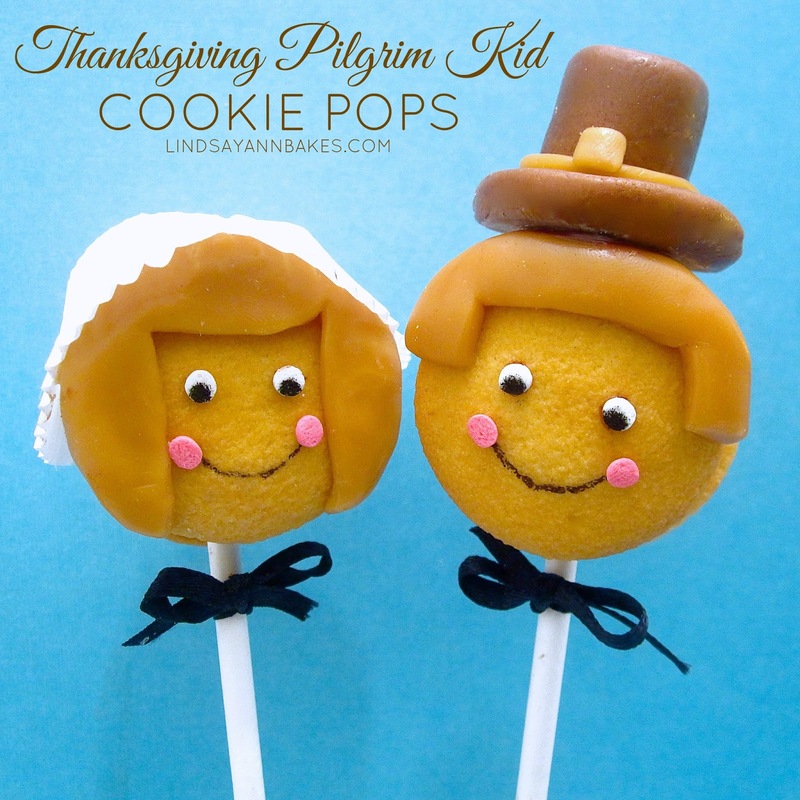 Create the hair styles for your pilgrims out of caramel squares. Using the warmth of your hands, roll one caramel square into a ball. Flatten the ball, so it is the same size as the vanilla wafer cookie. Cut the circle in half, reserving one half for the boy, and one half for the girl. With your fingers, sculpt and cut their hair to match the shapes in the bottom right corner of the photo below (boy's hair is on top, girl's hair is on bottom). Match each hair-do with a vanilla wafer cookie, and make sure it fits, covering the edges of the top and sides of the cookie. Find 2 white confetti sprinkles and 2 pink confetti sprinkles for the eyes and cheeks of each Pilgrim; set aside. Using your melted chocolate, attach hair to cookies. Use the edible black marker to draw on the pupils of the eyes and the smile. Attach the eyes and cheeks using the melted chocolate. Spread melted chocolate on the flat side of a vanilla wafer cookie, and top with half of a marshmallow (cut width wise). Spread melted chocolate on top of the marshmallow, and push lollipop stick through the bottom of the marshmallow. Top marshmallow with vanilla wafer face. 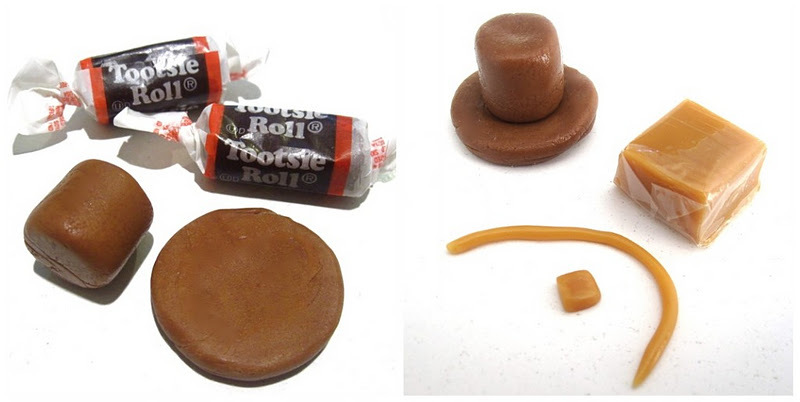 For the boy's Pilgrim hat you will need 2 tootsie rolls and a little extra caramel candy. Microwave tootsie rolls for just a few seconds, or use the warmth of your hands to create the brim of your hat, and the top of the hat. Use some caramel to create a thin rope around the hat and a small square buckle. Attach to the top of your Pilgirm boy's head with melted chocolate. Top you Pilgrim girl with a mini cupcake liner bonnet. 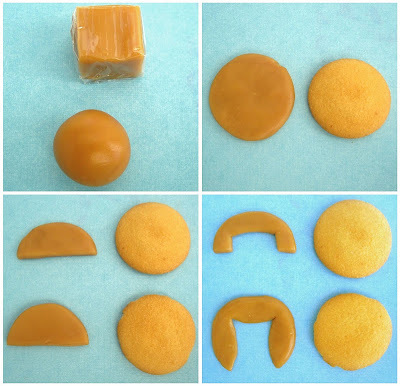 The flat bottom of the cupcake liner should be against the crown of the head, and the sides should stick right to the caramel hair. You can individually wrap your pops in clear plastic bags for a party favor, Thanksgiving dinner name tag, or you can create a display for your pops. To create a display that your pops can stand upright in, take a block of Styrofoam and wrap it in festive wrapping paper or tissue paper. Push the bottom of each stick into the styrofoam for guests to easily grab and enjoy.